See the VacuCobra by Kockums at the Queensland Safety Show. REDUCING the risk of back and other injuries from heavy lifting is a new, high speed vacuum tube lifter to be featured by Kockums Bulk Systems at the Queensland Safety Show from June 21 – 23, 2006. 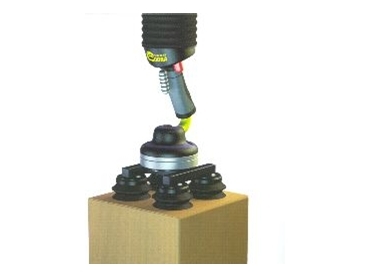 The new VacuCobra is an ergonomically designed vacuum tube lifter for goods up to 35kg. The bottom swivel and angle adapters increase freedom of motion when gripping the load and the quick-release function ensures no time is wasted. Kockums Bulk Systems also offers the original VacuEasyLift for heavier loads of up to 270kg. The VacuEasyLift can lift a wide range of loads from boxes, cases and cartons to drums and sheet material. Workers use the same handle to lift, lower and release the load, while using the vacuum to hold and lift the load. For companies looking for something other than the VacuCobra or VacuEasyLift, Kockums Bulk Systems offers custom designs for specific applications. Check out the new VacuCobra and other products at Kockums Bulk Systems' stand, H23, during the inaugural Queensland Safety Show at the Brisbane Convention & Exhibition Centre.